Open source software has always interested developers through the myriad of benefits they offer over conventional, licensed products. The industry’s gravitation towards open source products are visible in domains ranging from Storage, Middleware, Virtualization or even the Operating Systems (OS), to obtain desired functionalities without having to comply with complex license agreements. By providing its own Linux based distributions for OpenStack, DevOps and Security among many others, Red Hat has been instrumental in catering to the next generation IT demands of physical, virtual and cloud environments. Red Hat ecosystem spans a vast number of products, from Linux platforms to JBoss Middleware to the more recent Ansible—the engine to automate software provisioning, configuration management and application deployment. Red Hat’s Ansible Tower provides a centralized control over IT infrastructure through dashboards, with features like role-based access control and job scheduling. The API and CLI’s provided by the Ansible Tower simplifies its integration with existing enterprise tools and processes. The dynamism of Red Hat ecosystem has interested several enterprises that are on the lookout for right open source solutions for their requirements. In order to help enterprises in their mission, a distinguished panel comprising of CEOs, CIOs, analysts and the CIOReview editorial board has evaluated companies with a proven record of expertise in assisting enterprises with Red Hat solutions. 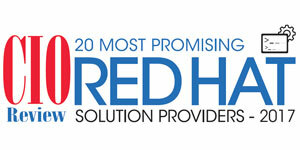 In this edition, we bring to you the “20 Most Promising Red Hat Solution Providers - 2017,” featuring companies that have made a mark in the area. SEP Software Red Hat and SEP are committed to meet customer needs providing all the functionality, performance and interoperability required to meet today’s demanding customer environments.